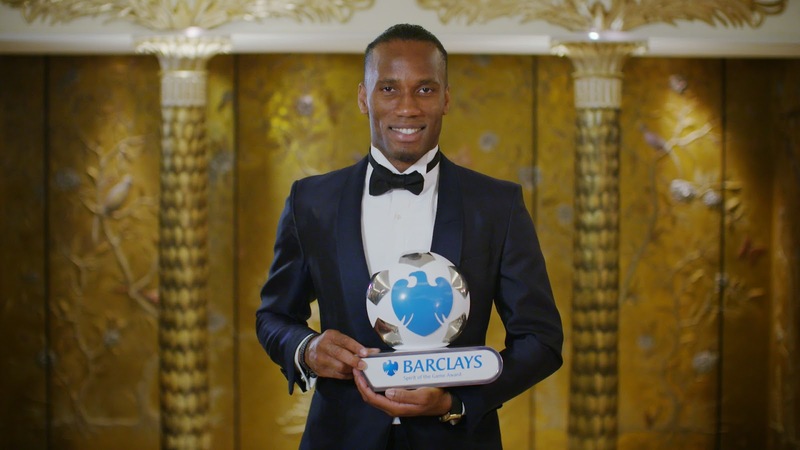 Chelsea forward Didier Drogba has been presented with a Barclays Spirit of the Game Award for his charity work with the Didier Drogba Foundation in Africa. Through his successful exploits on the field and his tireless charity work off it, Drogba hopes to inspire the next generation of footballers in the UK and Africa to fall in love with the game. In the latest Barclays video we meet Zebeto, a young boy growing up in the Ivory Coast who has been inspired by Didier Drogba and dreams about following his hero into the Barclays Premier League. Didier aims to help people like Zebeto achieve their dreams through the Didier Drogba Foundation, by contributing financial and material support in education and health. The Foundation has provided bags for Zebeto, his school friends and hundreds of other children, and has also built a medical clinic in his hometown of Abidjan, Ivory Coast, which will be opening its doors later this year. As well as donating all his commercial and sponsorship earnings, Didier recently helped to raise £400,000 for the Foundation at a charity ball attended by fellow footballers including; Petr Cech, Eden Hazard, Bransilav Ivanovic, Gary Cahill, Juan Cuadrado, Nemanja Matic, Thierry Henry, Louis Saha, Edgar Davids, Jermaine Defoe and John Terry. The money raised will be used to complete the medical clinic in Abidjan and help finance mobile clinics that will travel outside of the capital to those who are either to sick or poor to make the journey to the centre. Barclays are committed to helping the next generation of fans fall in love with football and for the remainder of the 2014/2015 season Barclays will give supporters the chance to win tickets to their favourite team every week via the Barclays Spirit of the Game website. Barclays will also once again be giving away more than 8,000 tickets to local communities in partnership with Barclays Premier League clubs.